Training: 10 minutes of teaching new strategies to the team. Scoreboard and Coaching: Take 10 minutes to look at pipelines and provide feedback. Summary and Action Items: Spend 5 minutes creating a bulleted list of what needs to be done. Editor’s note: This post was originally published on 5/9/17 and has been updated for accuracy and comprehension. How often does your sales team meet? At a minimum, you should be meeting once per week with everyone. That doesn’t mean, however, that it’s a free-for-all of “here’s what I’m working on now” -- a common pit sales meetings often fall into. Instead, it should be coordinated, planned and timed. In this post, I’m going to show you the exact template our sales team goes through every Monday for 30 minutes. But before I do, let’s lay down the ground rules. Without these rules in place, meetings are inefficient and time-consuming. Rule #1: The meeting must start and end on time (or earlier). When meetings go over, it shows you don’t respect your team members' time. Plus, they become antsy. Start on time and end in 20 to 30 minutes. Rule #3: Make it collaborative and interactive. Salesman Joe can’t come to the meeting every week and provide no input. The sales team is a unit for a reason. Everybody has to provide some sort of input or update during the meeting. With these three ground rules in place, you’ll set yourself up for massive success as a sales team. Sales teams that work together, cash checks together. 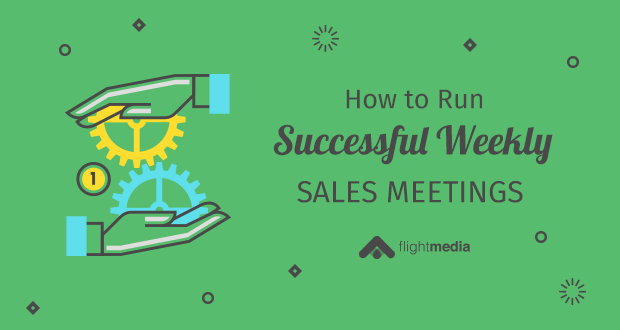 That said, here are the five main components of a successful sales meeting. That’s why it’s important to grab their attention from the very first minute. Start every meeting with an inspirational piece. Example: We play an inspirational Youtube video. But occasionally, we’ll read an excerpt from a book or read off a few quotes. Their salespeople leave inspired and motivated by the cool new incentives. Whatever you try, opening with inspiration in the first 3 to 5 minutes sets an incredible tone for the rest of the meeting. Once everyone is pumped up from the opening inspiration, it’s time to go round-robin and listen to different success stories about what’s working. What are a few deals that were closed in the last week and what were some sales techniques used to make them happen? Example: One of my good friends is an incredible car salesman at one of the largest Ford dealerships. Every week, his 55-person sales team talks about the “10-pounders” – the cars that brought $10,000 in profit and $2,500+ commission – that were sold the previous week. Salespeople love hearing success stories because it reminds them of the potential waiting at the end of their next call, meeting, email or encounter. What new processes and systems are you looking to implement with your sales team? Roll them out during this time. 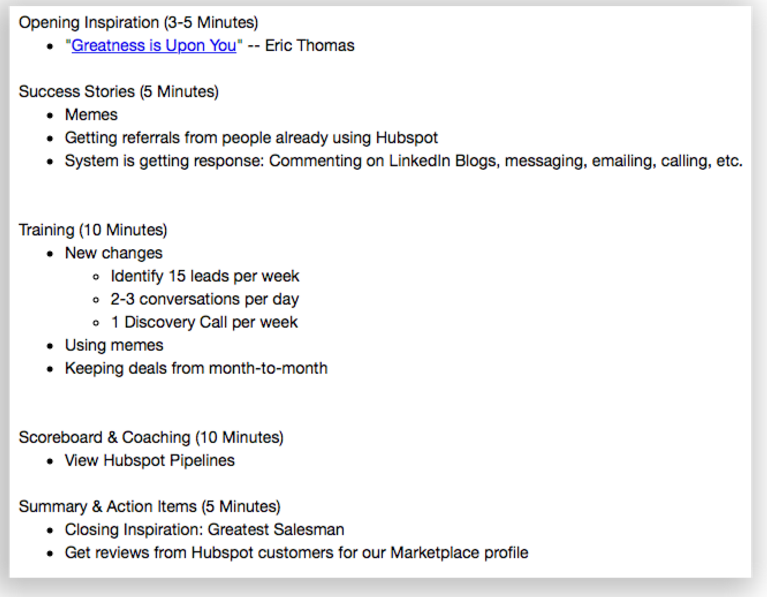 If you created a new sales cadence, spend 10 minutes running through it and answering questions. 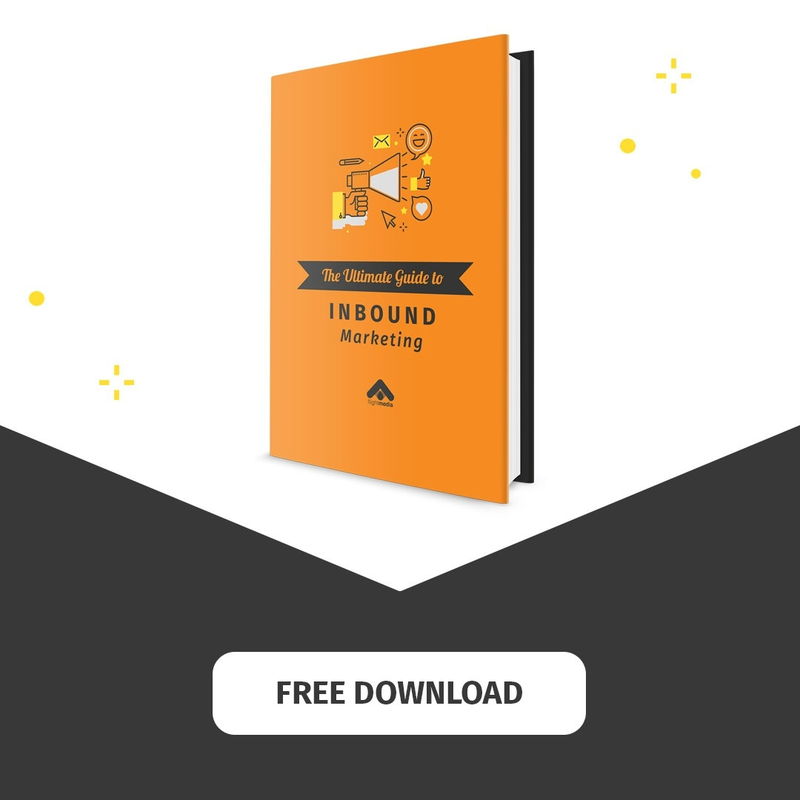 If the marketing team just rolled out a strategy that will bring in new inbound leads, discuss what the process will be for those new leads. Example: We once had a challenge with people not properly categorizing their tracked time, so we did a short screen-share training on how to use the time-tracking software and what to track certain activities under. This is probably the most important component to your weekly sales meeting. Because at the end of the day, your sales team wants to be closing more deals. And one of the best ways to help them do that is by viewing their current pipeline and providing feedback on how you believe they can best close the deal. 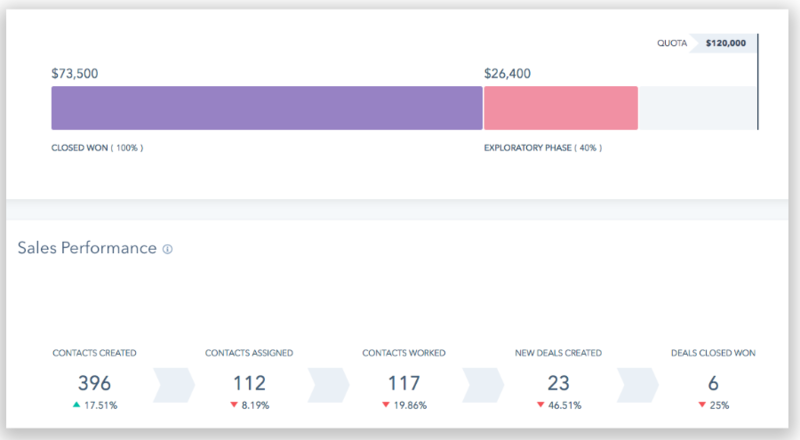 From this view, we’ll drill down into the deals that are in the “Exploratory” phase, discuss what’s holding it back, and give actionable ideas to get them to move forward. Whatever CRM you use, make sure you dive into it and look at the numbers – they don’t lie. Set the precedent that each salesperson must come prepared to discuss one of their leads. By the end of the meeting, you should have a list of things people need to get done. Not every person may have tasks, but a few people will. If you did a training that requires that everyone complete a task, then your team will individually need to complete it. Have a designated “note-taker” create a list of the tasks throughout the meeting. Once the meeting adjourns, send a recap email of these five sales-meeting components. The “Summary and Action Items” section should have a bullet-point list of what needs to be done by the next meeting and who is responsible for the task. We keep track of our meeting agenda in Evernote and send it out after every meeting. Everyone likes to be acknowledged. Recognizing a team member for a job well done has actually been proven to increase their productivity and overall performance. When you’re leading a sales team meeting, never miss a chance to provide motivation by letting your people know how much they’re appreciated. Weekly sales meetings can be as effective or worthless as you want. Too many sales teams wing their meetings, with no agenda, and get nothing out of them. By implementing a planned, structured meeting flow, your salespeople will be more motivated, close more deals, and operate more as a unit – rather than a bunch of wild monkeys. What’s something you cover in your weekly sales meetings? Leave a comment below! I’d love to hear what you’re doing!